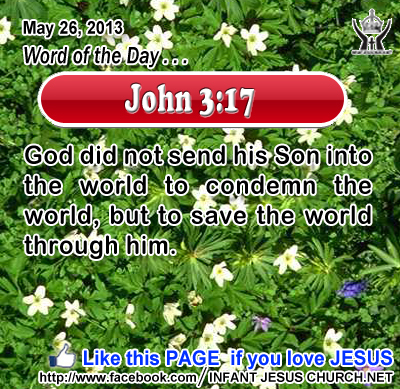 John 3:17 God did not send his Son into the world to condemn the world, but to save the world through him. Heavenly Father, thank you that you live with those of us who are regretful and repentant and who long for your presence. You know we are only earthly, but you love us. You know that we are flawed, but you redeemed us. You know that we are not perfect, but sent Jesus as the perfect sacrifice to save us. Thank you Lord. Through Infant Jesus we offer our sincerest gratitude and praise. Amen. 12"I have yet many things to say to you, but you cannot bear them now. 13 When the Spirit of truth comes, he will guide you into all the truth; for he will not speak on his own authority, but whatever he hears he will speak, and he will declare to you the things that are to come. 14 He will glorify me, for he will take what is mine and declare it to you. 15 All that the Father has is mine; therefore I said that he will take what is mine and declare it to you..
Heavenly Father by his relationship to his only-begotten Son, who, reciprocally, is Son only in relation to his Father. The Spirit, likewise, is inseparably one with the Father and the Son. Jesus reveals the triune character of God and the inseparable union of the Father, Son, and Holy Spirit. The missions of Jesus and of the Holy Spirit are the same to reveal the glory of God and to share that glory with us by uniting us in a commuunity of love with the Father, Son, and Holy Spirit. That is why Jesus tells his disciples that the Spirit will reveal the glory of the Father and the Son and will speak what is true. Before his Passover, Jesus revealed the Holy Spirit as the “Paraclete” and Helper who will be with Jesus’ disciples to teach and direct them “into all the truth”. The final end, the purpose for which God created us, is the entry of God's creatures into the great unity of the blessed Trinity. In baptism we are called to share in the life of the Holy Trinity here on earth in faith and after death in everlasting light. How can we personally know the Father and his Son, our Lord Jesus Christ? It is the Holy Spirit who reveals the Father and the Son to us and who gives us the gift of faith to know and appreciate the truth of God’s word. Through the Holy Spirit, we announce our ancient faith in the saving death and resurrection of Jesus Christ until he comes again. The Lord gives us his Holy Spirit as our heavenly Teacher and Helper that we may grow in the knowledge and wisdom of God. Do we seek the wisdom that comes from above and do we eagerly listen to God's word and obey it?.